Before we get into exchanges, let’s refresh our minds about what cryptocurrency is. The concept behind cryptocurrencies is relatively simple, while the math and technology are not. Essentially, a cryptocurrency is a virtual or digital currency that utilizes cryptography as a means for protection and security. Cryptography is also used to regulate the creation of additional units, so as to not drive the overall digital currency market wild. One of the greatest appeals of cryptocurrencies is that they are not regulated by any government agencies. The most popular digital asset is the bitcoin, followed by ethereum. 1 What Are Cryptocurrency Exchanges? Cryptocurrencies can be traded through cryptocurrency exchanges. These cryptocurrency exchanges are platforms through which you can purchase or sell digital currencies for dollars, euros, and pounds, as well as other digital assets. For example, you can sell bitcoins and purchase dollars with the sold bitcoins, or you could exchange bitcoins for ether. These exchanges are a vital part of the virtual currency expansion rate. There are private exchanges, which are exclusive and operate by invite only, as well as those available for the public. Local exchanges also exist. Some are easier to use than others are; certain exchanges are so flexible that digital assets can be traded directly through the built-in chat features of specific popular messengers, like Telegram. Here are a few things you will want to consider before picking the best cryptocurrency exchange suited for your trading and speculative needs. Fees – Almost all exchanges charge fees for you to do business on their platforms. Make sure that when you are signing up or committing yourself to a specific exchange that you know everything about its fees. Verification Requirements and Security – These are vital to understand before starting out on an exchange. Most exchanges require some sort of identity verification in the form of a passport, driver’s license, proof of residence, or other similar document before joining. The more complex the verification process, the safer the exchange platform. Exchange Rates – Exchange rates are also important, as you don’t want to join a cryptocurrency exchange that charges draconian fees for transactions and exchanges. That just wouldn’t be fair to you or financially savvy. Reputation – The best cryptocurrency exchanges always have ups and downs. However, the general opinion of the top ones is positive. The best exchanges have a solid reputation and are well trusted by traders. Region – It’s also important to find an exchange that supports your geographic region. Some exchanges may support all of the countries in South America, while not supporting any of the countries in Asia, and vice versa. If you are living in Russia, for example, make sure you pick the best exchange platform that supports your region. Now, let’s take a look at some of the best cryptocurrency exchanges out there. Something which is important to bare in mind when choosing a cryptocurrency exchange to make your trades and purchases on is their security measures. It is well-known that many exchanges have been hacked in the past, most notably the Mt Gox exchange, which people are still feeling the fall-out from ever since. You should know that the your funds or coins on an exchange or not really yours, unless you own the private keys to the wallet of your coins you are relying on someone else to be custodian of your funds. Luckily there are some basic measures you can take when using an exchange. The most important is to never store more there than you are willing to lose, if you have a significant balance, you should withdraw it back to your own wallet and for extra security, use a Hardware wallet to secure these funds. Exchanges should be used for quick purchases of your desired cryptocurrency or for trading an amount you are happy with. They should never be used as your primary wallet, that is not their intended function. Another important step to take is to use all the security options available on the site, make sure that two-factor authentication (2FA) is setup correctly and you use an app like Authy or Google authenticator. Do not use the mobile phone option which texts you a code, this is not safe as their have been a number of high-profile hacks involving sim-swaps which allow a would-be hacker to take over your phone number and then gain access to your account. Coinbase is one of the, if not the, most trusted cryptocurrency exchange platforms in the world. It is also the largest digital asset exchange platform in the world. The platform supports more than 32 countries and has more than 4 million active users. Traders are allowed to acquire and sell bitcoins using their bank account, credit card, PayPal, and other payment methods, as well. In order to begin trading on Coinbase, you will have to set up an e-wallet for buying and selling cryptocurrencies. Furthermore, users have to be able to link a valid bank account in order to purchase bitcoins. Currently, fully verified U.S. residents are only allowed to hold up to 50,000 bitcoins per day. Overall, Coinbase has a great reputation and is highly respected in the trader community. Most transactions through Coinbase only have a 1 percent transaction fee in addition to any fees that your selected payment method may carry. As with CEX, you can only purchase a few currencies: Bitcoin, Ethereum and Litecoin. You would then need to use Changelly to convert these to other crypto currencies. Another benefit of registering with Coinbase is the fact you are then able to use the Coinbase Pro exchange which is owed by the same company. Coinbase Pro allows to more advanced trading features such as margin trading and Market, Limit, & Stop Orders. Coinbase Pro also has lower fees than Coinbase. Read our full Coinbase Review here to learn more. We have also conducted a thourough look at Coinbase’s security measures here. 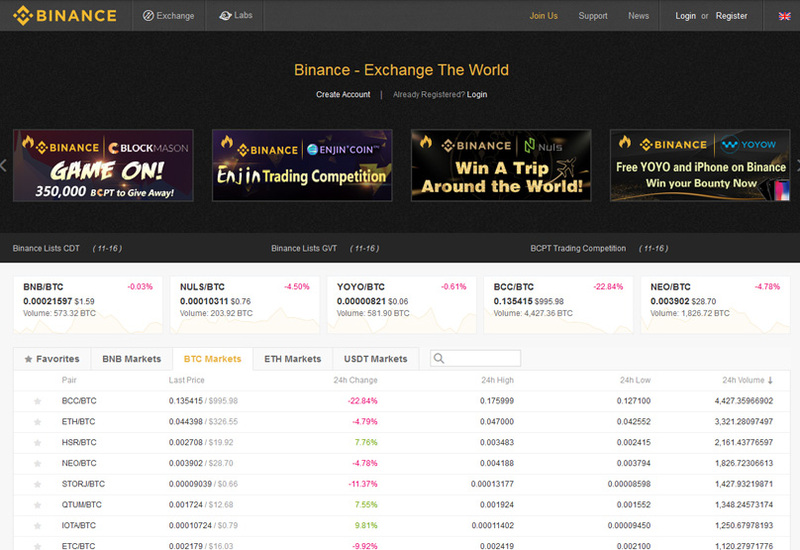 Binance is a newer exchange but one we have grown to love, it has a wide range of cryptocurrencies available to purchase and trade and has a basic and advanced view which you can switch between easily. Their fees are very reasonable and they allow you to register and trade immediately without having to verify your account. You will then be able to make withdrawals of up to 2 BTC per day, if you want to withdraw higher amounts you will then need to upload your photo ID and a “selfie” photo. The public opinion of Binance at this time is very high with people praising the speed of the site, ease of use and cheap fees. For more details you can read our complete review of Binance here. KuCoin is a new but very exciting exchange based in South Korea. They operate similarly to Binance in the fact that they list new altcoins much quicker than other exchanges so it’s a good place to purchase cryptocurrencies shortly after their ICO meaning there is a greater opportunity to profit by getting in early. The interface is very clean and modern and much easier to operate than other older and more clunky exchanges. They also offer their own token KCS which allows all holders to receive a daily share of profits of the platform, this is a great token to hold as you are paid in the many different currencies that the site allows people to trade in. LocalBitcoins is a peer-to-peer cryptocurrency exchange used in most big cities around the world. The general principle behind this exchange is that you can find people who live in your area or city and meet with them in person to conduct an exchange. The platform also offers options for purchasing digital currencies via PayPal, Square, direct-to-bank transfers, and many other payment-processing methods. The platform charges a small fee of 1 percent per transaction in cases where sellers apply their own exchange rate. Take a look at our LocalBitcoins Review to find out more. CoinMama is a large bitcoin brokerage that allows users to acquire coins with their debit or credit cards. The platform issues small fees for transactions. To make up for this, however, the limits for how many bitcoins a user can buy are much higher in comparison to Coinbase. Users can acquire up to $5,000 of coins per day or up to $20,000 per month. All users need to do to use CoinMama is to set up an account, log in, and navigate to the profile page section to fill in personal information. Following this, users will be introduced to a page that allows them to select how many bitcoins they would like to purchase, and once a fitting amount has been selected, users will be allowed to add their preferred payment methods and bitcoin addresses. Users will also be required to verify their phone number and email address. CoinMama does not require most users to upload their government-issued ID. After completing the aforementioned steps and passing the verification process, users will be able to acquire bitcoins through CoinMama. Read our complete CoinMama Review here. CEX.IO is one of the oldest cryptocurrency exchanges in the world. However, despite being referred to as a cryptocurrency exchange, CEX.IO can only be used with bitcoins and ethereum which are the main two trading pairs for alt-coins. If you want to purchase other currencies, you can use CEX and then a service named Changelly to convert them to many other cryptos. The platform is registered with the FINCEN and applies KYC and AML principles. In other words, users have to completely verify their identity before they can get involved in any trades with this platform. Currently, the platform supports purchases with credit cards, wire transfers, or SEPA transfers for European residents. Once you enter a trade, the platform automatically calculates the price of the transaction and freezes the exchange rate for 120 seconds, which is quite convenient. However, many users note that there are occasional hidden fees. CEX.IO has a flat fee of 7 percent for anything involving fiat currencies. For example, if you acquire $100 in bitcoins, you will only receive $93 in coins. Read our indepth CEX Review here to learn more. Bittrex is well established and highly regarded crypto trading platform, with many coins and tokens to choose from. The interface is not for complete beginner’s but you should be able to find your way around after a little while. Read our full review of Bittrex here. Unsurprisingly, Bittrex’s most popular trading pairs are BTC and ETH. It must be noted that the exchange currently does not offer any kind of fiat-to-crypto pairs, e.g. with U.S. dollars, euros, or British pounds). One thing investors can do is buy USDT (Tether tokens) via wired bank transfers in order to use USDT for crypto-to-crypto exchanges. However, you’ll need to be fully verified and willing to slap down at least $10,000 USD for Bittrex to even consider the transfer. And we here at Blockonomi don’t remind this approach anyways; there’s been a lot of controversy surrounding Tether lately, and it’s best just to stay away for now until further developments actualize. Picking the ideal cryptocurrency exchange platform for your specific needs may be a difficult and time-consuming process. Remember to pay attention to the fees, reputation, security, verification processes, and geographical services an exchange platform has to offer. Remember that you are not limited to using only one cryptocurrency exchange. Hopefully, the information provided will assist you in deciding which exchange platform to use. We have selected 6 Cryptocurrency exchanges here which are trustworthy and easy to use for beginners to get started building their investment portfolios. Signup to download our eBook Collection. We will also send our weekly newsletter on a Friday lunchtime with the latest Crypto News & topics from Blockonomi. No Spam, ever. 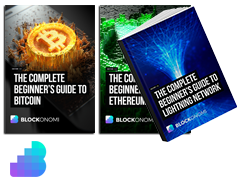 You will receive 3 books: Bitcoin, Ethereum & Lightning Network + All Future Books. Editor-in-Chief of Blockonomi and founder of Kooc Media, A UK-Based Online Media Company. Believer in Open-Source Software, Blockchain Technology & a Free and Fair Internet for all. All content on Blockonomi.com is provided solely for informational purposes, and is not an offer to buy or sell or a solicitation of an offer to buy or sell any security, product, service or investment. The opinions expressed in this Site do not constitute investment advice and independent financial advice should be sought where appropriate. Hi, thanks for this article. Should I use a cryptocurrency exchange or a Wallet? Very informative, and helpful site. Thank you. I have one question, when you transfer funds to a wallet, are they stored as the amount of coins, or current Fiat value when you send it to your wallet? The wallet stores the coins that you put in it safely and you can keep track of them. Also you can send them back out to the exchanges if you want to sell them. The wallet just stores the coins but they will still go up or down in price with the market. I like your post very much and advice to other read this about Safest Cryptocurrency Exchange. TaurusCoin offer the profit of up to 45% in a month. You are also able to get daily benefit. Very nicely summed up! A question for you. Say if I am using CoinBase and I use Changelly to convert BTC to XRP, can I keep the XRP’s in CB or it has to be in some wallet that supports purchase of XRP? Such awesome advice here, thanks for sharing! Thanks a lot! Realyy help for beginers!!! Your article profiled 6 different exchanges, and yet at the end of your article you wrote, “We have selected 3 Cryptocurrency exchanges here which are trustworthy and easy to use for beginners to get started building their investment portfolios.” Which of the 6 exchanges you wrote about are your “selected 3”. Thanks for all the great information. I look forward to your reply! Iv just opened a Binance account , However Im totaly confused, Iv now discovered I can only WITHDRAW , 2 BTC a day ( Ill assume there talking about Bitcoin) or 100 with a 2FA), I must be confused, what good is that when it comes time to cash out and I want to transfer my Coins or back into cash . Lets say I have 50 Bit coin or 10,000 XRP , i want to withdraw, at 2 BTC a day that would take me 25 days to get all my money out of the Exchange.. this cant be right. Can you explain. The other question is , How does Binance work if I cant buy crypto coins there in the first place without other crypto coins ? Catch 22 . Example my current exchanges excepts Cash deposits into an account from which I can buy XRP, It would appear Binance has no access for cash purchases . Can you explain. Im still very green on how they work. This article isn’t up-to-date. Bittrex does offer USD trading and USD bank accounts. Plus, Binance has grown a lot since this article was written. It has an excellent reputation and moved their operations from Hong Kong to Malta. You now need verification if you wish to withdraw more than two bitcoin. They are regarded as a top exchange with 10 million users as of October 2018 with a capacity for 20 million at this time. On top of that, Binance is heavily into supporting startups around the world. Although they do add newer coins to the exchange sooner than some, they don’t allow rubbish. Underperforming coins get deregistered. This is fast becoming a favourite exchange for many around the world. Binance at this stage is only a crypto to crypto exchange. I’m sure just like Bittrex recently did, it will add the feature as it grows. It’s not even 18 months since it’s ICO. Like a lot of exchanges, you use your local entry exchange like Coinbase or Bittrex in USA, Cointree or Coinspot in Australia; each country has at least one. You then transfer your BTC or other coins to Binance for your trade of choice. If you wish to sell out into your local currency, you then reverse the procedure. As for withdraws; Submit your ID and photo – follow the instructions exactly – and once your KYC has been verified you will get a daily 200 BTC equivalent – plenty for the average person. It’s a bit confusing at first, however you soon get your head around the space. This is why there still isn’t mass adoption; people need to be responsible for their security; it’s cumbersome at the moment as opposed to phoning your local stock broker and placing an order. I did lots of research in the beginning and signed up to reputable analyst subscriptions. They always give you step by step instructions and importantly, keep you up to date on all developments across the industry. Sign up to Telegram and join the groups; Binance being one. All the crypto companies are on there. I used everything in this list, but I am confused by the availability of limits and the need to create an account. Today, I opted for the changenow, a platform with a simple exchange without limits and registration. For me, this is the best option. I heard a lot about changenow and recently checked it out. My claim was processed in less than half an hour, which is not bad at all. I agree with you that this is the best option for quick swapping.